Santa Monica Pier 2012 Twilight Concert Series Starts Tonight! - Yo! Venice! Home Neighboring Communities Santa Monica Pier 2012 Twilight Concert Series Starts Tonight! Santa Monica Pier 2012 Twilight Concert Series Starts Tonight! 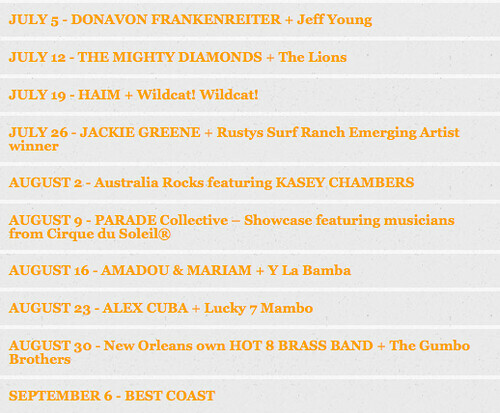 The Santa Monica Pier 2012 Twilight Concert Series starts this evening at 7pm! Tonight will feature Donavon Frankenreiter and Jeff Young! July 12: The Mighty Diamonds (Classic Reggae from Jamaica) and Los Angeles-based reggae band The Lions! July 19: HAIM (Sisters Singing Indie Pop) and Wildcat! Wildcat! Aug. 30: New Orleans’ Hot 8 Brass Band and Venice’s The Gumbo Brothers! Sept. 6: BEST COAST: Indie Rock evoking the life, light and feeling of So Cal.